We can show you how to make these wooden wall plates and adaptable air grills that helped turn that dated space into a woodworking showplace. You can size the air grills to fit any opening, and even use them for projects that have nothing to do with your homes heating, such as shower grates, hot plates, or welcome mats. The wall plates work for light switches and receptacles with the same rectangular shape. 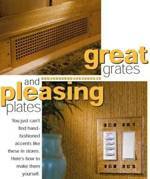 We show all of the plans you will need for one, two, or three gang electrical boxes. You can easily extend the dimensions for four or more switches ganged together. Also included are a couple of simple jigs to help you complete this project. Wood and/or Supplies needed: Use a wood of your choice.